Bed caps are the highest quality, most accurate fitting. BAK bed caps are made from the highest quality 100% UV protected CENTREX ABS and are equipped with more 3M tape than any other bedcap on the market. They are manufactured on state of the art thermoforming technology and trimmed on computerized 5 axis CNC routers for an unmistakeable consistency and accuracy. Made to strict dimensions for the perfect contoured fit these bed caps perfectly match any under rail or spray on bedliner. Warp resistant and Impact resistant. No-Drill easy installation using 3M tape. 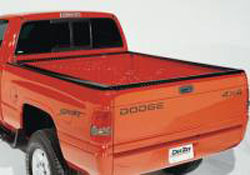 100% UV protected Will not effect installation or fit of Camper's Tops, Tonneau Covers, Tool Boxes or Racks. Will not rub or vibrate paint. Paintable for an exact color match. Available with optional matching tailgate cap. The tailgate caps really finishes off the "look" and that's where you'll get the most damage without one. As is with all most bed caps Bushwackers are compatible with camper shells or tonneau covers or anything you attach to the rails. Don't worry about any paint damage with the "stick on" type. They vibrate "with the truck" and not against it so you can take these off years down the road and you'll still have the "new paint" look and a higher trade in value. Isn't it time you got some bed caps?